Facial recognition has the potential to make life easier and safer, but it could also invade our personal privacy — and we may not even know it’s happening. In a short amount of time, facial recognition has become a part of our daily life. And for good reason: it has the power to make our lives easier, our travel more seamless, our cities safer. But with this new technology comes a slew of privacy concerns and implications that we’ve only just started to consider. So, how do we leverage the benefits of facial recognition while protecting our identities? What organizations choose to do with our likeness is one issue. Another concern — perhaps a greater one — is how they’re acquiring our images in the first place. Facial recognition technology is designed to be seamless. But when “seamless” becomes “secret,” it can also become a little scary. For example, many people don’t realize that when you get a driver’s license, your image may become part of a government database. That means police can search your photo without reasonable suspicion, even if you’ve never committed a crime. There’s also secret surveillance, which can happen from a distance — so an organization, like the FBI, could keep tabs on you and your activities without your knowledge, much less your consent. So, anonymity may soon become a thing of the past, if it hasn’t already. Thanks to facial recognition, people can easily be tracked, searched for, and found. And the future of computer vision is only going to facilitate this. The technology is expanding in such a way that computers will be able to see in the dark, at high distances, even around corners. It’s no secret that our legislative system is slow-moving, so it’s impossible to keep pace with ever-changing technology. Even though facial recognition has been in the picture for several years, there are still very few laws that dictate who can take your picture, or sell it, or buy it. Some states, like Illinois, Washington, and New Hampshire are in the process of passing new legislation, but these state-level bills won’t apply to the federal government, so their effectiveness is limited. If you think it sounds conspiracy theory-ish, you’re not alone. Because legal protections aren’t in place, researchers have developed ways to help individuals hide in plain sight. 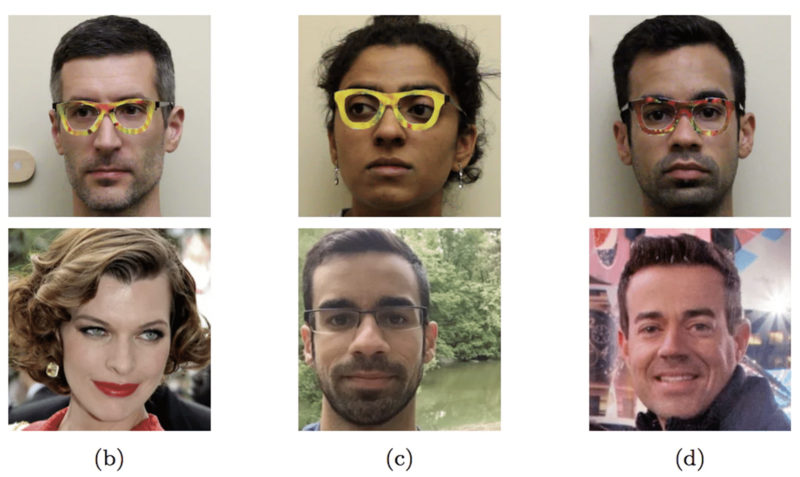 ‍Pictures showing how researchers used their glasses to impersonate celebrities, as well as each other. You can also purchase “privacy visors” — currently on the market for $240 — which reflect light back into the camera, preventing facial recognition systems from seeing you at all. There’s even specialized makeup that makes the wearer invisible to facial recognition technology. There’s a reason that facial recognition is everywhere: its benefits are vast and varied. But whenever new technology becomes widely (and rapidly) adopted, we make some collective trade-offs. And while they may be worth it in the end, it’s critical that we consider every potential consequence — and that we use the technology as transparently and responsibly as we can.